Provide comfort for the family of Michael Garcia with a meaningful gesture of sympathy. 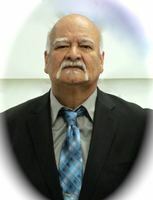 Michael “Big Mike” Garcia, Sr. 65 died Tuesday March 26, 2019 at his home in Garden City. He was born October 27, 1953 in Garden City the son of Manuel & Phyllis (Pichardo) Garcia. Michael attended St. Mary Catholic School and graduated from Garden City Senior High School. Growing up he pitched in and helped the family owned business “El Zarape” grow into the legacy it is today. He married the mother of his children, Michelle Gerstner, in Garden City. They later divorced. He worked for USD 457 as a truancy officer at Abe Hubert Middle School for many years and was an authority figure, mentor, and friend to many youth that needed his guidance. His impact in that field led many to become successful adults. His favorite past time was cheering for the Pittsburg Steelers and making sure his sister Cookie could hear him loud and clear when he did so. He also enjoyed fishing, spending time with his dogs, and spending time with his grandkids. His shared many fun times with his special nephew, Jordan, who will forever cherish the memories created with love. He was preceded in death by his Parents- Manuel & Phyllis Garcia & Siblings- Guadalupe Jimenez, Secundino Garcia, Andrea Flores, & Joey Garcia, Sr.
A Rosary will be held 7:00 pm Monday April 1, 2019 and Funeral Mass 10:30 am on Tuesday April 2, 2019 both at St. Mary Catholic Church. Friends may call 1:00 -8:00 pm Sunday March 31, 2018 and 9:00 am to 5:00 pm Monday April 1, 2019 at Garnand Funeral Home in Garden City. A private family burial at Valley View will take place at a later date. The family suggests memorials to the Michael Garcia Memorial Fund in care of Garnand Funeral Home, 412 N 7th Street, Garden City, Kansas. To plant a memorial tree in honor of Michael Garcia Sr., please visit our Heartfelt Sympathies Store. 0 trees have been planted in memory of Michael Garcia Sr. I extend my heartfelt sympathy to Mr. Garcia's family. He will be sorely missed and fondly remembered for his kindness and good spirit. In this time of unimaginable grief, you can find great comfort in the hope for the future present in the bible. At Isaiah 25: 8, the Bible promises a time when God “will swallow up death forever.” Also, Acts 24:15 boldly states, "there is going to be a resurrection." The resurrection this verse talks about will give us the opportunity to see our lost loved ones again on Earth. I know it will be a joyous time when you can see Mr. Garcia again! I worked with Mike at Abe Hubert and he always had a smile on his face ! Sad to hear of his passing. God speed !